Wrinkles, age spots, sun spots, spider veins, pigmented and vascular lesions, are outward manifestations of aging or sun damaged skin. Once accepted as a fact of growing older, these skin imperfections can now be safely and easily treated. A comprehensive skin rejuvenation treatment may include several treatment goals simultaneously; the improvement of fine lines and skin texture and the removal of age spots and spider veins. LHE technology’s innovative balance of Light and Heat creates a more efficient photothermal process that enables low energy levels. This low energy level (measured in Joules/cm²) optimizes safety and eliminates the need for pre-treatment protocols or skin cooling techniques. Non ablative, LHE treatments are faster and safer with absolutely no downtime, giving your clients the freedom to squeeze a quick appointment into their busy day. As skin ages and is exposed to the elements of nature, it suffers from degradation and imperfections. Using LHE technology, short pulses of light and heat selectively target and coagulate chromophores in the epidermis and papillary dermis. Oxy-hemoglobin in vascular lesions and melanin in pigmented lesions are coagulated. The coagulated cells are eliminated by a natural process and replaced by new cells. At the same time, LHE creates a mild thermal insult to the dermal-epidermal junction. The insult triggers a wound-healing process and new collagen remodels under an undamaged outer layer. As collagen rebuilds, fine lines and wrinkles disappear or fade. 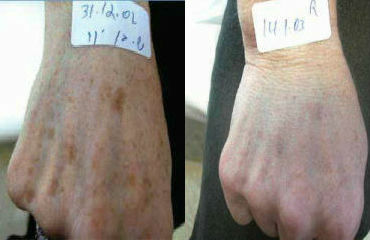 LHE results in clearer, smoother, younger looking skin. The best candidates for LHE rejuvenation have red, flushed faces, unsightly facial veins, sun-damaged skin, hyperpigmentation, or enlarged pores. Powered by unique LHE technology, utilizing the combined energy of Light and Heat, this system allows treatment of pigmented and vascular lesions, skin aging effects and fine lines as well as wrinkles. Treatments are quick, efficient, and safe. The unique combination of light and heat energy maintains lower heat levels than any other light-based treatment modality, allowing for the highest safety margins without need for skin cooling. LHE has demonstrated a clinically proven ability to safely deliver more youthful looking skin and a high level of client satisfaction. LHE technology’s innovative balance of Light and Heat creates a more efficient photothermal process that enables low energy levels. This low J/cm² level optimizes safety and eliminates the need for pre-treatment protocols or skin cooling techniques. Safe and reliable – Optimal use of light and heat energy for safely treating the sensitive facial area. Visible results – Noticeable improvement in pigmented and vascular lesions, skin complexion, and fine lines and wrinkles after just a few treatments. Quick treatment and no down time – A typical session lasts 10 minutes with no need for preparation or recovery time.